MY INTERVIEW WITH BRUCE JENNER. Bruce Jenner walked into our radio station early. He had a big smile, a warm handshake and a friendly, relaxed demeanor. Bruce was gracious, charming and funny. On-the-air and off. Some guests would only be “on” when the red light was on. Not Jenner. He conveyed the message, “I’m happy to be here!” And following our interview, he even hung around to pose for pictures with me and other members of the WFYR radio team. It was the 1980s, long before the relentlessly-hyped, headline-grabbing April 24th conversation between Jenner and ABC’s Diane Sawyer, seen by 17 million viewers. While frequently promoted as, “The Interview,” there was a far more valuable and impactful Bruce Jenner dialogue to me. My interview with him, when Jenner was a guest on my radio talk-show in Chicago, The Connection. When Jenner and I visited, he wasn’t a “reality TV star.” In reality though, he was a star. A big one. A celebrity. An Olympic gold medalist. An American hero! Our focus here, won’t be on Jenner’s transgender announcement. Instead, it’ll be on our conversation thirty years ago. What I learned from him then and have applied for three decades. And what you too can learn from him and apply with remarkable results. If you choose. Yet there’s one thing Jenner said during the ABC commercials to promote his interview with Sawyer I found especially interesting. Because when I heard it, it immediately took me back to our interview. Jenner said in the ABC TV spots, “My whole life has been getting me ready for this.” And I realized, that’s quintessential Jenner. Really no different “today” versus three decades ago, with his approach or preparation. He’s a focused, disciplined winner. Jenner knew how to prepare mentally and physically for victory. How to become a world-record-holder and a gold medalist in the grueling Olympic decathlon competition. As a radio and TV broadcaster, I interviewed many professional athletes who performed at peak or championship levels. And all of them had one thing in common. They visualized their success. Visualization helped them create a mental rehearsal for the real thing. Yet the most striking example of the power of visualization, is Jenner’s. 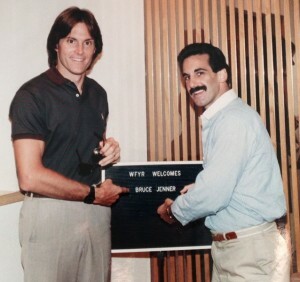 I asked Bruce to tell me about his gold medal and record-setting decathlon victory in Montreal in 1976. He said the victory in Montreal was for the world to witness, but what he called the “victory in ’72,” was even harder to secure, because it was a victory only within his mind. He told me from the moment he lost in Munich in 1972, he began to rededicate and recommit himself to his goal, the gold medal in the decathlon. He saw himself victorious every day for the next four years. He saw himself standing on the victor’s platform with the gold medal draped around his neck. He saw himself circling Olympic Stadium waving the American flag. Bruce Jenner visualized victory and it became reality. Bruce Jenner’s success is a dramatic testament to the impact of visualization. And visualization is also linked to another step in positively programming your belief system. And that’s graphic reinforcement or using pictures to help you focus on your dream(s), desired outcome(s) or goal(s). Bruce Jenner also used this winning strategy. Jenner told me he took a picture of the gold, silver and bronze medalists from the 1972 Olympic games and then altered the picture in a unique way. He cut out from the picture, the head of the gold medalist. And in its place, he pasted his own face. For the next four years, he stared at a picture showing him, Bruce Jenner, to be the gold medalist. He once again stressed, “Jeff I won the gold in my mind and in that picture, after I lost in Munich in 1972.” He added, “I merely went to Montreal in 1976, to pick up a medal I already won!” How’s that for a powerful example? What might your pictures or words of graphic reinforcement be? For your life? Career? Business? If you’d like, here’s a fun project. When I’m conducting goal setting results-sessions, I have participants create goal setting achievement posters or vision boards. They’re surrounded by personal photos and lots of magazines. The magazines are a source of inspiration, with articles, words and pictures about successful people or ads promoting products people might like to own. Graphic reinforcement can be a single picture, or with the goals posters, it can be several pictures. The vision boards tell a story of accomplishment and success at both personal and professional levels. Clients’ posters have included pictures of their dream home, a vacation getaway, a new car, the corporate logo of a prospect they’re pursuing, an ideal weight, or words reinforcing their lifestyle or approach to business, i.e., family first, teamwork, persistence, healthy, innovation, imagine what’s possible or We can! See them. Believe them. Pursue them. Realize them. Yet always remember, goals are only realized with a process in place to seek and attain them. And we, as individuals and as a world progress, because we “see” and choose to have a better life. Here’s to your better life, your better business, your better you, as you stand upon your victory stand!